More from the dark continent. While one in nine South Africans is infected with HIV, the country's health minister has advocated a new three-pronged approach to AIDS treatment: lemon, garlic and beetroot. This suggestion has been met with derison from the international health community. However, no international response yet to the ministers other controversial programs which include treating limb fractures with creme brulee, administering a thick layer of foie gras and truffle oil to third degree burns, and immunizing infants against polio via injections of gravy. In other culinary news, Mozambique attempts to one-up places like Malawi and Nigeria with residents who are not just cannibals, but necro-cannibals. And finally, Zimbabwe has managed to resolve its economic woes by simply lopping three zeros off the old denominations on bank notes. Zimbabweans were permitted to exchange a limit of 100 million old Zimbabwe dollars [$40] for new currency in a single transaction each week since August 1. 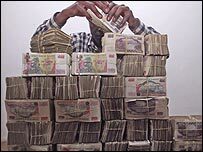 At left, a Zimbabwean prepares to go to the store to buy a loaf of bread. 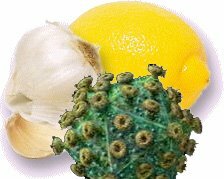 I dont think there's any proof that lemon and garlic and beeteroot DOESN'T cure the aids. Why are we westerners so quick to judge other cultures who have lived in peace and harmony with the natural world for so long?